Mesothelioma is a condition in which the abdomen and lungs are attacked by cancer. What causes mesothelioma? Medical research studies had been conducted to find the cause of this condition. And it is concluded that exposure of microscopic asbestos fibers is the culprit of this serious condition. When a person breathes in this particular fiber for a long time will likely suffer from mesothelioma. Long period of asbestos exposure doesn’t only cause this cancerous condition. It also causes asbestosis. Asbestosis is a type of breathing disorder which is incurable. This type of cancer is quite rare. However, those who work in certain industries can have higher risk of suffering from this condition. Some of the industries are asbestos mine, asbestos processing plant, automotive industries, construction industries. Moreover, those who work in military ships or living near asbestos mine also have high risk of getting this cancer. Asbestosis and mesothelioma can also occur on people who disturb asbestos products during their home renovation and those who are living with asbestos workers. Now that we know the risk factors and what causes mesothelioma, we must be careful and perform certain preventions. Since asbestos exposure can happen at work and old homes, it is a must for you to know how to prevent this condition. If you are working with asbestos directly or indirectly, you need to make sure that you follow all the safety procedures. Some of them are wearing face mask and cleaning yourself properly before you go home. And if you are worried about asbestos exposure at home, you need to make sure that the materials which contain asbestos are in a good condition. If it is slightly damaged, you can seal it. However, if it is badly damaged, you need to call a professional to remove it. The symptoms of mesothelioma usually will show after years of exposure. Some asbestos workers suffered from its symptoms around 20 years after the initial exposure. It is because this condition increases overtime. 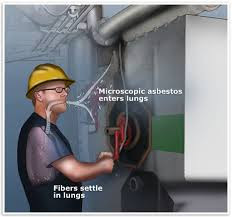 People who are breathing in or swallowing asbestos fibers will have difficulty in getting rid of them. These fibers stay in their lung or abdomen for years. And they will damage the cells gradually and turn the cells into cancerous ones. Some of the symptoms of mesothelioma are fever, pain or swelling at the abdomen, anemia, weight loss, bowel obstruction, and blood clotting abnormalities. If you are suffering from these symptoms, you need to medical treatment immediately. The treatment for this cancerous condition is expensive. However, you can seek justice and support to cover the medication bill if you are mesothelioma victims. If you were working in an industry with high asbestos exposure risk or you got secondary asbestos exposure from your spouse, you can hire a lawyer to obtain support and justice. Hopefully, this article on what causes mesothelioma helps you to have better prevention.